Spring is finally here, and along with the beautiful weather and green lawns come the inevitable pests. Per the U.S. Department of Agriculture, pests cause more than 200 million dollars’ worth of turf damage annually! One of the main culprits? White grubs, inconspicuous pests that do their damage under cover. Don’t let your lawn be part of the statistic; learn a little about this pest to limit your chances of serious lawn destruction this season! Grubs are the larvae stage of several types of beetles, two of which are well-known to most of us as the Japanese beetle and the June bug. Both prefer sunny lawns with moist soil and are especially attracted to lawns that are watered regularly during the hot and dry periods. During mid and late summer, the beetles are ready to lay their eggs underground, leaving them to hatch into young grubs amongst the grass roots. This allows the hungry little grubs to feast on your lawn’s succulent roots. What’s good for the grubs’ growth is detrimental to your lawn! They continue feasting through the fall, and that’s when they do the most damage. As winter approaches, they dig down as deep as one foot, escaping from the cold and becoming inactive for the winter. In the spring, they become active again, and continue to dine on your lawn’s roots. This seasonal cycle continues for three years until the grubs reach maturity. They then become beetles and fly into your garden for a different type of meal, and so the cycle continues. If you have wildlife (such as racoons and skunks) digging up your lawn at night, they may be after a yummy snack of grubs. Once grass roots are gone, they don’t grow back, causing dry brown patches of grass. These brown grass areas may feel spongy when you walk on them. You can investigate further by checking the root zone of the sod. Peel back the sod: if it lifts easily, that’s never a good sign, but it may not mean you’re infested with grubs. You’ll need to look for them closely; they’re white and about a half-inch in length with a dark head and legs, and when disturbed they curl into a C-shape. If you find one or two just below the lifted sod, go a little further, digging down another one to two inches. If you find more than three or four grubs within a square foot area, your lawn is infested, and you’ll need help! Once you see the damage, it’s far too late to control. Additionally, the damaged area will not recover because the root system is dead. You found grubs, so now what? Many homeowners attempt to treat the problem themselves, with varying degrees of success. The process can be quite demanding; treatment of grubs is ongoing, not a one-and-done pesticide application. Treatments applied by professionals tend to be much more successful, and there are various pesticides that can be used. Our licensed and experienced professionals know lawns and the pests that infest them. You can rely on ProLawnPlus to choose the correct treatment for your lawn, and we always keep your children and pets’ wellbeing in mind. We want to thank you for your business in 2018, our 40th year! We are excited to work with you again in 2019! OTHERWISE, WE WILL BEGIN SERVICE ONCE THE WEATHER PERMITS. As you know, 2018 was one of the wettest years on record in the Baltimore. This made it very challenging for anyone who does outside work to complete it in a timely fashion. We had an overwhelming demand for fall seeding in 2018 and because of the weather, we had many days when we could not get our aeration and seeding equipment on lawns. In the future, we will be trying to get our seeding sold earlier in the year so we can schedule them in advance and meet the demand. If you are not already scheduled for aeration/seeding and think you will want it done this fall, please let us know so we can give you a price and get you in the schedule. We are generally booked for seeding by August 15th. In addition to aeration/seeding, we offer a Mosquito Control Program, a Flea & Tick control to help prevent Lyme Disease and other tick-borne illnesses, Organic Root Stimulant to help improve root development, Perimeter Pest Control to help protect your home from insect invasion and a Tree & Shrub Program. Please call our office to speak to our knowledgeable staff or visit our website (www.prolawnplus.com) for more information or a free estimate. Please note that on our website, you can pay your bill, set up auto-pay, see what services you have scheduled, refer friends or send us a note. Click on the tab that says, “Log In To Your Account” and set up your account. We appreciate any referrals you give us. As a show of our appreciation, if any of your referrals sign up with us, we will credit your account $25.00. Also, the customer you refer would get a $25.00 credit off of their first treatment. Again, if you have any questions about what program(s) might be best for you, please call or email us. Be assured that our goal is to provide you with a beautiful lawn and/or landscape by giving you the best possible service in a professional manner using the safest materials possible. Nothing interrupts a pleasant evening quite like a mosquito buzzing around your ear. Mosquitoes are certainly annoying, and their bites can be aggravating – but they can also carry West Nile or Zika Virus, which makes them a more serious health and safety concern. The mosquito has quite an awful reputation. It has been called the biggest killer on the planet and the most deadly animal in the world. With just one bite it can cause great havoc by spreading devastating illnesses like West Nile Virus, Encephalitis, Malaria, Chikungunya and even Heartworm in pets. These threats are becoming more and more of a concern locally. WBAL and other news outlets have done stories like this one discussing the pests and health risks associated with them. Our mosquito control program consists of 3-4 sprays to ensure control all season. We start by checking the entire area to eliminate standing water that mosquitoes need to breed. We then apply a barrier spray, using a mist blower, in order to repel mosquitoes in the future. Call (410) 825-8873 or email us today to request a free estimate for service. A manager will visit, evaluate your property and leave you an estimate for service. Grubs have been forced lower into the soil due to the drought conditions we’ve faced late Summer this year. With the recent wet weather, they will return to the surface and start to feed on lawns. Be on the lookout for brown areas in your lawn that are easily pulled up. See video below. 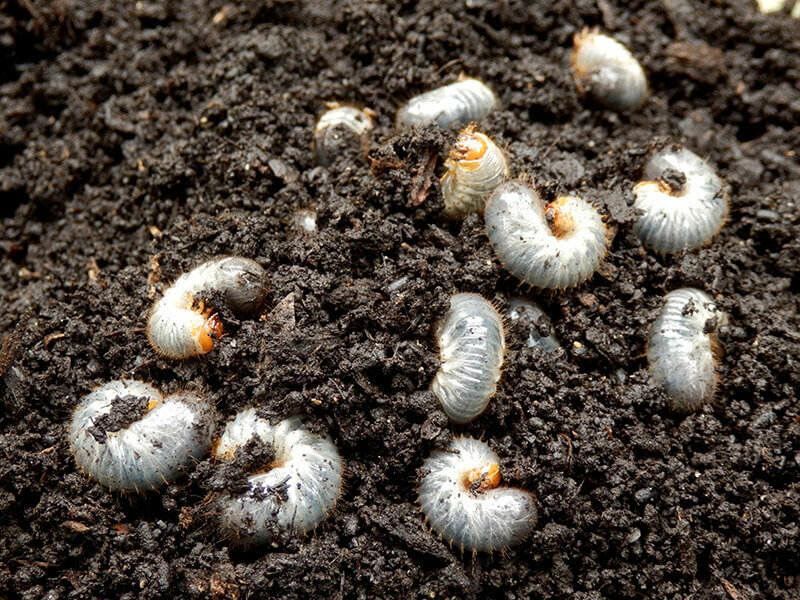 Most grub damage occurs in September and early October. The optimal time to prevent grubs is from late April through mid-July. Curative treatments in August through October are less effective and require immediate irrigation for effective results. Grubs can cause severe damage to lawns in Maryland. They are the larvae of several species of beetles but the most common here in Maryland is the Japanese Beetle grub. Their life cycle takes one year to complete. The beetles emerge from the soil in late June/early July and feed on trees and shrubs. During July and into early August, they mate and lay eggs in the soil. The eggs hatch in August and begin feeding on turfgrass roots, especially when there is adequate soil moisture. Weeds that appear in hot summer weather are some of the toughest to control. They germinate when your lawn is under stress from heat, humidity and drought and thrive under these conditions. Some summer weeds are grass like and are not susceptible to ‘normal’ weed control measures. Here are some of the weeds you will be seeing during these hot summer months. If a bright, yellow-green, grass-like weed is detracting from your lawn’s beauty, there’s a good chance that you’re dealing with nutsedge. Nutsedge is a yellow-green warm season perennial. It has upright, grass-like leaves with a glossy upper surface and dull lower surface that emerge from the base of the plant. The leaves are 1/8 to 1/2 inch wide, up to 3 feet long, and have parallel veins with a prominent midvein. Its flat topped, burr-like flowers occur July to September and are affixed to the end of a stout triangular stem. It grows in all soil types, especially moist ones, but does not tolerate shade. Nutsedge is a perennial weed that is hard to eliminate, mainly because it reproduces itself from tubers beneath the soil. If you hand-pull nutsedge, the tuber is usually left behind and will regerminate. Nutsedge grows quickly in low, wet soil. Left unchecked, it will grow as tall as 2-3 feet! Pro-Lawn-Plus’s 5 Treatment program includes a summer weed spray, that helps control nutsedge. But in lawns with an abundance of nutsedge, it is usually necessary to add one or two supplemental treatments. Click for more information on Nutsedge. Dallisgrass is a light green warm season perennial. It spreads upright forming clumps with leaves that are about 1/2 inch wide. It germinates in 60 to 65 degree soils, and although it thrives in the hot and humid south, it can be found all the way up to Maryland. The best way to remove this plant is by pulling out the clumps with your hands or a small garden tool since no herbicide is currently labeled to selectively control it. Click for more information on Dallisgrass. Spotted Spurge is a summer annual that produces seeds in 60 to 90 degrees Fahrenheit. From a central taproot, it grows a flat, extensively-branched mat up to 2 feet in diameter. The stems leak a milky sap when broken. Its leaves are small, oval and up to 3/5 inch long. They can be purple spotted and hairy. Flowers occur June to October and are small and cup shaped. It is found in thin, drought-stressed soil in hot climates and closely mowed grass. This weed is resistant to many weed control products. To minimize Spotted Spurge, water deeply, aerate your lawn, fertilize in autumn and avoid close mowing. Click for more information on Spotted Spurge. For information about these and other weeds, visit the Difficult to control weeds section of our website . Though we can’t control mushrooms directly, there are management practices that can reduce them. Mushrooms in your lawn call for different measures than standard lawn weed control. Mushrooms are classified as fungi, rather than weeds. 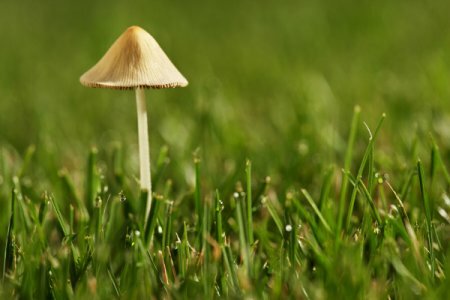 Most mushroom-producing fungi in lawns are actually beneficial, because they break down organic matter, releasing nutrients that promote plant growth. Extensive areas of fungi in your lawn, with or without mushrooms, may require more aggressive management. Give ProLawn Plus a call today for a free lawn care estimate. We will provide a complete lawn analysis and recommendations to rid your lawn of mushrooms and other fungi, allowing your lawn to be able to grow to its full potential. ProLawnPlus provides professional lawn care and tree/shrub services for Maryland residents in Baltimore City, Baltimore County, Howard County, in addition to portions of Harford and Carroll Counties. Brown Patch disease (Rhizoctonia spp.) occurs in Maryland in warm, humid weather. The combination of daytime temperatures that are over 85°F and nighttime temperatures that stay above 65° F with little air flow leaving the grass moist for over eight hours are the perfect conditions for this turf disease. You can identify Brown Patch by its symptoms. Light tan lesions with dark brown edges across the middle or tips of the grass blades are signs you might have Brown Patch. On mornings with abundant dew, you will actually be able to see the signs of the fungal mycelium which look like cottony structures. It is mainly a problem on improved varieties of Tall Fescue. If you have a variety that is especially susceptible to Brown Patch disease and the ideal environmental conditions are expected for an extended period of time, you might need to have your lawn treated with a fungicide to avoid having to reseed the lawn in the fall. However, if a cold front is expected within a few days to lower the humidity and nighttime temperatures, it may not be necessary to spray. Our Lawn Care Company offers lawn fertilizing, lawn weed control, crabgrass control, flea and tick control, and aeration and seeding services to Maryland residents in Baltimore City, Baltimore County, Howard County, and also portions of Harford County and Carroll County.